Ask a bunch of Adventure riders to name their favourite tyre. Chances are you will get as many opinions as riders in the bar. Adventure riding is an on and off road activity, how much of either you indulge in may depend on the sort of riding you like and where and how far you ride. Decades ago advertising copywriters perfected tyres that worked equally well on and off road. Perhaps my favourite piece of nonsense was the ‘Claw Action tyre’ This wonder was advertised with diagrams which clearly showed how the tyre actually gripped the ground, pincer-style, as the carcass flexed over the terrain. Miracle dual-purpose tyres continue to be advertised. I remain unconvinced. While progress has been made, the problem remains much as it has always been. 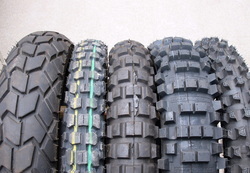 The better a tyre is off road the faster it wears and the less it grips on road. The opposite is also true. The stark reality is that tyres made for road riding and those so called big bike ‘enduro’ tyres do not work in most off road conditions experienced in NZ. Experts, let alone beginners, struggle with the wrong tyres in typically steep, wet and diverse NZ conditions.